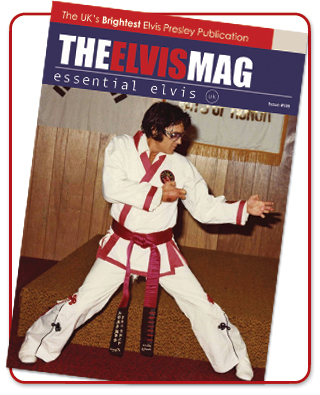 The second part of an article looking at those great tracks on which Elvis plays piano. Here we round up the guys that were by Elvis’ side in the 1950s and ‘60s. A reminder of some of the great bonus tracks added to some of Elvis’ soundtrack LPs. We talk to British fan and author Matt Shepherd about his new book. A brief round-up of the latest import CD / vinyl releases (along with one DVD). A detailed article and interview regarding Glen’s latest new album Glen Campbell Sings For The King. WE KISS GOODBYE TO BERNICE BABY! A sad farewell to Elvis’ beautiful Live A Little, Love A Little co-star, Michele Carey. Trevor Simpson reports on a recent visit to Budapest in Hungary and the Elvis Presley Park. Buy now using our online shopping cart.